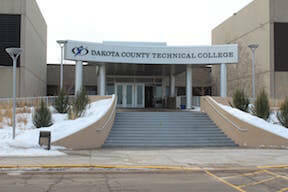 On Wednesday, February 28th, Dakota County Technical College hosted the Spring Transportation Showcase. This was the biggest Showcase to date with 9 high schools participating and over 300 students visiting the campus for the event from throughout the metro area, eastern Minnesota, and western Wisconsin. 40+ industry partners attended the event from the Automotive Technician, Auto Body Collision, Heavy Equipment, and Heavy Truck Programs. 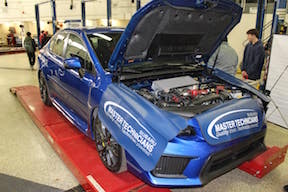 This was a wonderful opportunity for prospective students, current students, and members of the industry to network together about careers in the automotive field. Jobs highlighted include: auto repair, collision and auto body, service advisors and more. The event was filled with hourly giveaways and food for all of those that attended. Items included scholarships and tool certificates, as well as numerous smaller items donated by the attending vendors. The event was also a great chance to view cool products on hand from the industry partners showing what type of equipment one would expect to work on if they were to gain employment at their company. The traditional student pipelines are simply not sufficient to meet the demands of the current transportation industries. The Transportation Showcase was designed to create an environment where the local business partners, college and high school educators, and current and potential students can interact face to face to generate greater interest in careers in the transportation industry.